Bed Bug bites are unpleasant, itchy, and can have a number of adverse health effects. The effects of bites will vary greatly from individual with some individuals having no visible symptoms and, on the other extreme, other individuals experiencing itching, swelling, pain, blisters, allergic reactions, and even psychological effects. It should be noted that a single bed bug bite will most often not cause any serious symptoms and the problem lies in individuals who are in an infested area and are bitten repeatedly. There are cases in which antihistamines (for allergies) and other medications are used to treat bites, but most effects resolve themselves within a week or two once their cause has been eliminated. Unfortunately, for the most part, the only way to treat bed bug bites is to get rid of the bed bugs. Bed Bugs are mostly nocturnal feeders (they feed mostly at night) and generally feed for anywhere from three to ten minutes at a time. The bite itself is generally painless and, for that reason, several bugs are able to feed on a person throughout a night without that person become aware. Somewhere between several hours and several days later, the bites may become the itchy welts most familiarly associated with bed bug bites. Bed bugs will bite on any exposed area of the skin. Bites on the arms and legs are the most common as these areas are often the most exposed during sleep. Around a bite, the body’s reaction can cause anything from slight discoloration of the skin, to large red welts similar to mosquito bites or bruises. Bed bug saliva contains an anticoagulant (something that prevents blood from clotting) which may cause the bites to bleed. 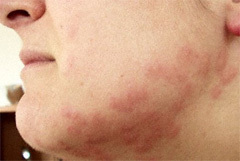 Several bites in the same area may lead to general redness of the skin and to hives-like symptoms not necessarily around the bites themselves. Several bites or a chronic infestation may lead to Anemia, as every bite removes a small amount of blood from the system. Serious infestation can cause stress and anxiety in those experiencing them. These can lead to insomnia and, rarely, a psychological condition in which an individual believes he is carrying and can ‘feel’ parasites on him when this is not actually the case. Anaphylaxis (a severe, potentially lethal, allergic reaction) has been recorded as a response to bed bug bites, but is extremely rare.